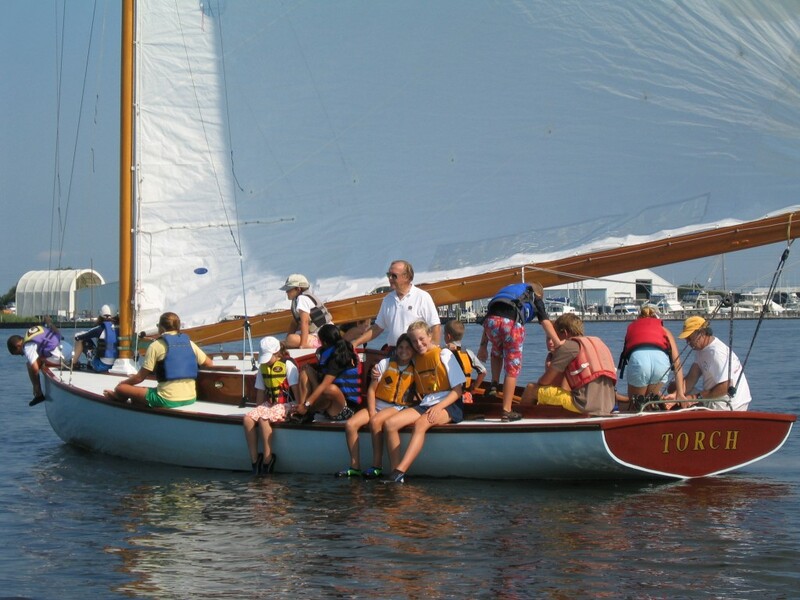 Acats are the predominant remaining subset of a lineage of large wooden catboats that were raced, sometimes against wooden sloops, back into the 1800’s on Barnegat Bay. 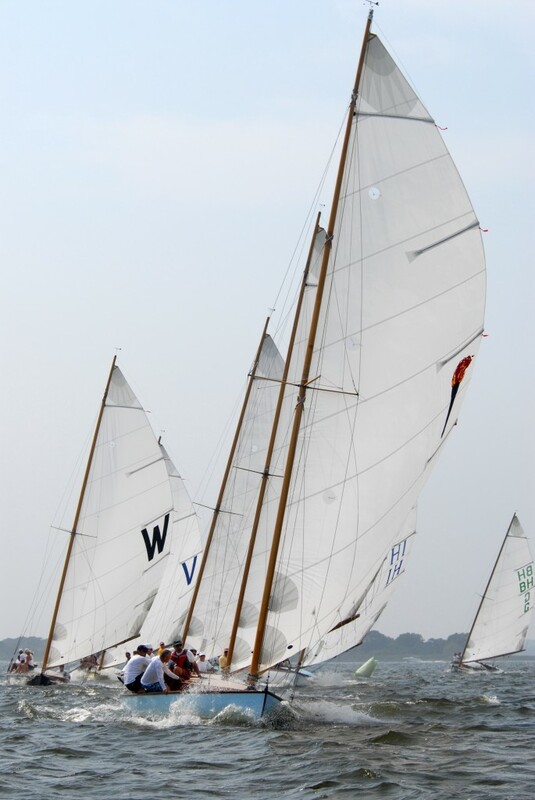 Many of these earliest racing sailboats were also workboats used to transport passengers or cargo. 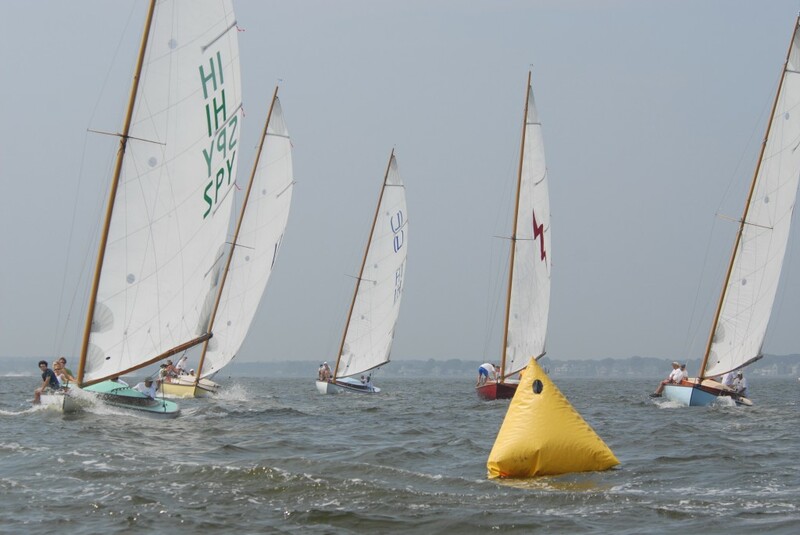 Acats are recognizable today by their majestic stature and grace under sail, perhaps most noticeable because of their comparatively large size when much of Barnegat Bay is shallow enough to be preferential to smaller boats. 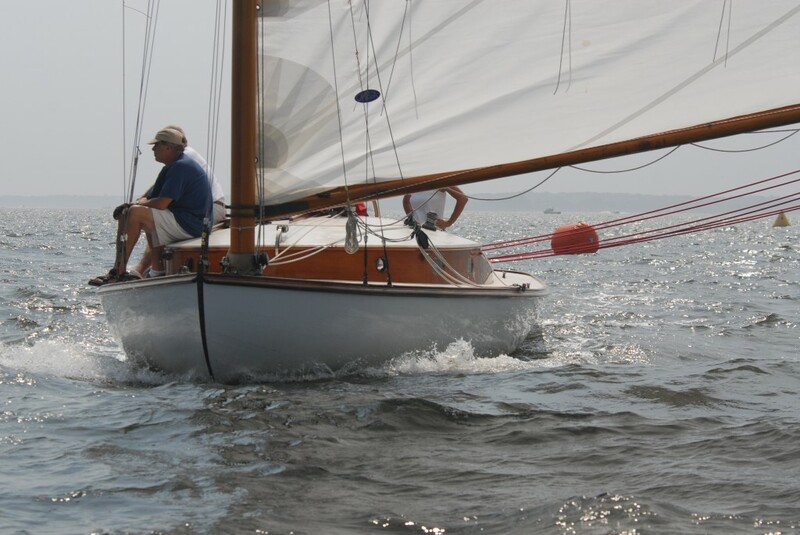 Acats and catboats in general are wide, low, stable, single-masted sailboats with a centerboard. They are about 28 feet in overall length, 22 feet long at the waterline, 10 feet wide, and carry a Marconi rig on a mast 48-1/2 feet tall. The helmsman and the main sheet trimmer need strength and endurance for the tiller and mainsheet, while at least half the crewmembers need agility to scurry rapidly around the front of the mast in tacks as they are shuttled as human ballast. 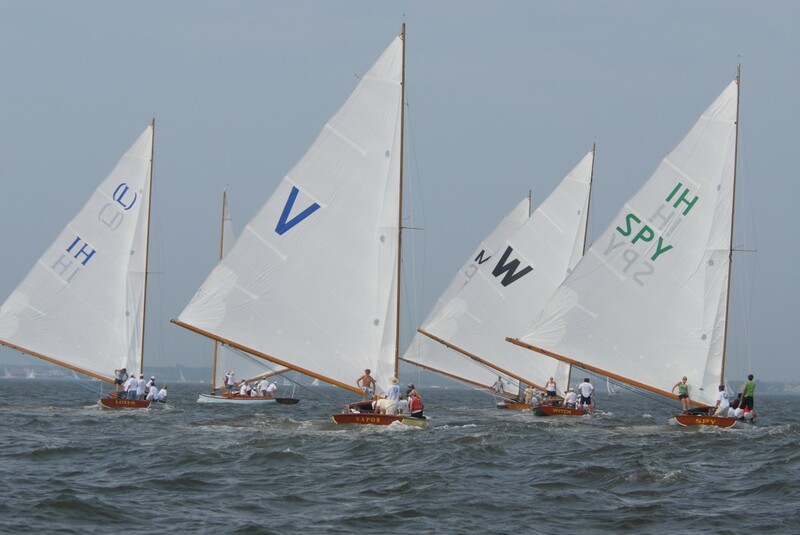 The catboats considered “Acats” generally fall into one of two designs, the Charles Mower design originally drawn for the boat Mary Ann in 1922, and the Francis Sweisguth design drawn for Tamwock and Forcem in 1923. These two original competing designs remain the basis for Acat construction today. Unlike most boats in sailing fleets, every Acat has a history and identity. Twelve of the 17 Acats built race regularly today. The earliest Acats were Mary Ann, Bat, Spy, Lotus, Tamwock, Helen, and Forcem, all built in the 1920’s. Four of them were restored one or more times and continued to race for at least 70 years. Mary Ann and Lotus still race today. Wasp, commissioned by Nelson Hartranft in the late 1970’s, was the first Acat built in more than 50 years. Nelson was so taken with the Acats he had already restored all four of the surviving boats — Mary Ann, Bat, Spy, and Lotus — before finding an old Sweisguth Acat plan that became the basis for Wasp. He’s credited at that time with saving the fleet. It wasn’t until the 1990’s that the Acat fleet started to truly grow again, with the addition of Tamwock (II), Ghost, and Vapor. 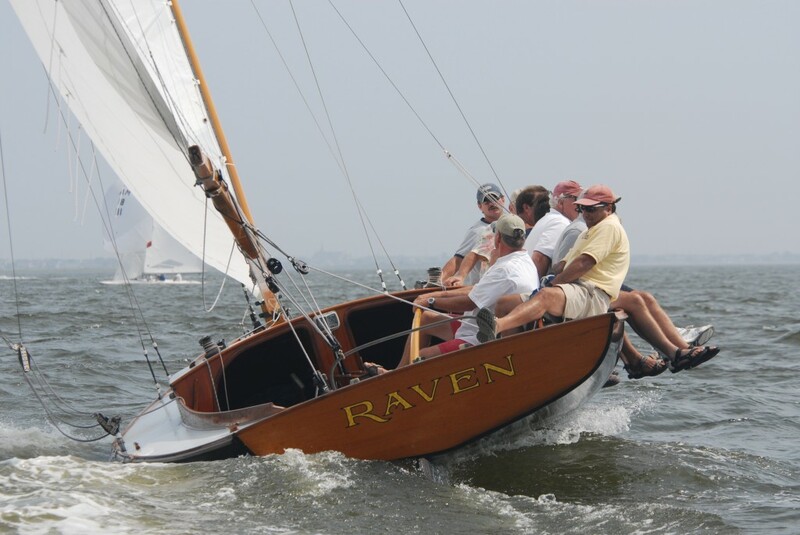 The greatest resurgence of these wooden boats, though, has been since 2000, with the addition of Spy (II), Raven, Torch, Witch, Lightning and Spyder. All of us that have been lucky enough to sail on one of these Acats hope this class of awe inspiring traditional wooden sailboats will continue to race for a long time to come.